October 15, 2013 at 10:52 am Add a comment! 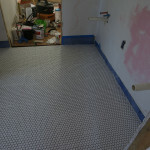 Let me tell you something, tiling is hard work. It took forever but it is COMPLETE! 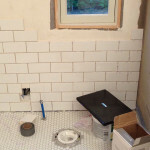 I’ve got some more exciting bathroom updates to share – 2 sinks! 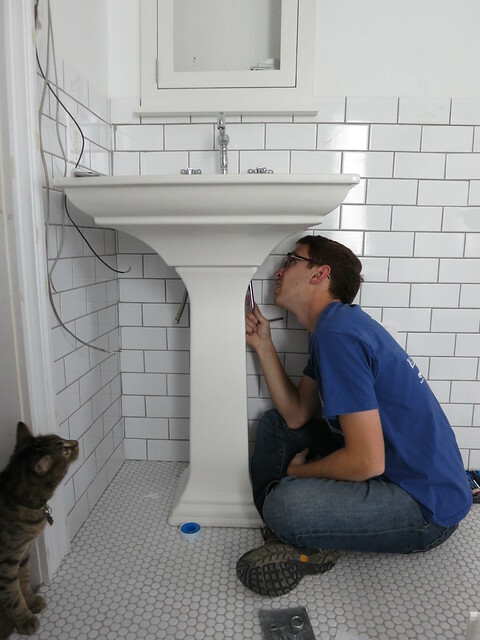 Here’s Stefan fiddlin’ with the left sink some more. It took a good bit of work to get them to stop leaking but we can both dis-assemble a sink drain in 30 sec flat after all the practice. And, of course, Vector is helping. I love this picture. Vector follows Stefan around like he’s the greatest human of all time and he always wants to help. I’m sure you all think that we pose our cat into these pictures but I often don’t even notice him until I’m writing the post. He really is with us ALL THE TIME and must be in the way whenever we’re working on the house. He’s a good kitty and we like having him around but there arae times when he has to be put in “his” room to prevent him from making mischief. Enough about the cat. 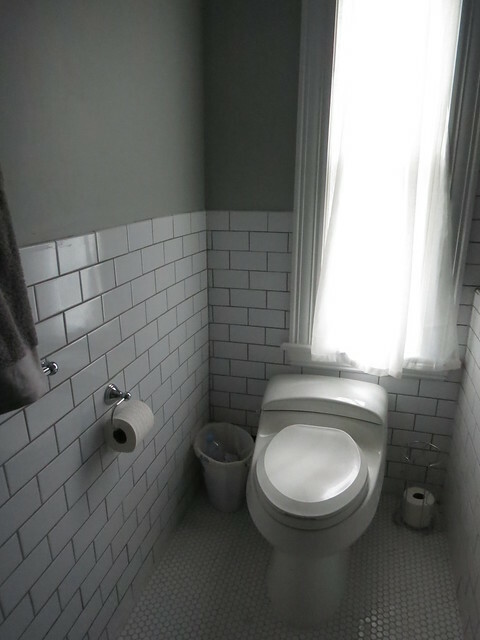 Now for some bathroom reveal…. 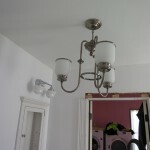 The paint color is Behr Perfect Silver and I LOVE it. 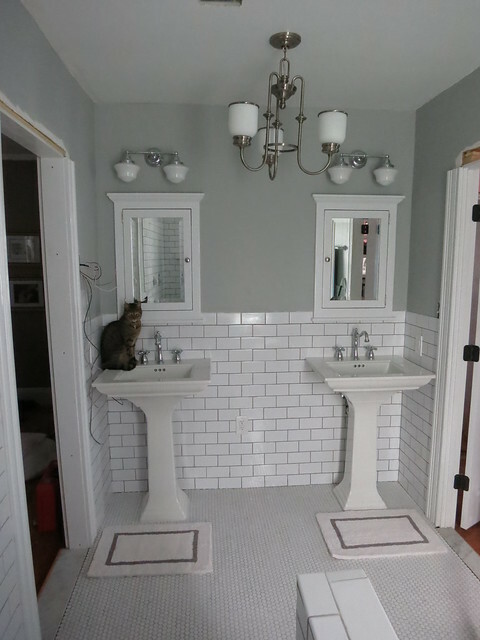 It’s a perfect neutral gray and it looks awesome with the gray grout. The little rugs are from home goods and the gray towels are cheapy ones from Target but I wanted something to finish off the room. 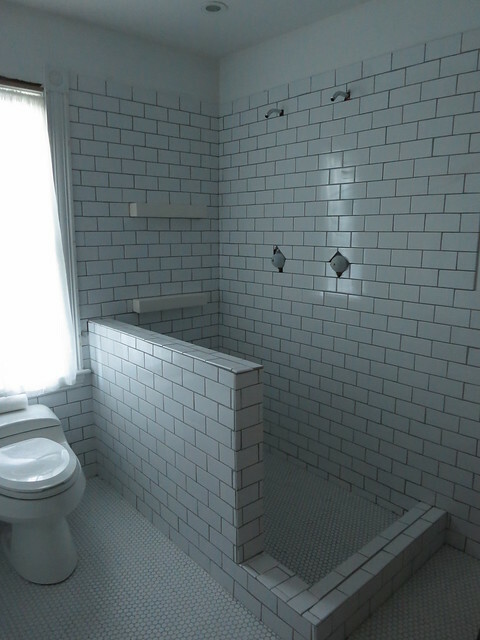 We got the Original Frameless Shower Doors. 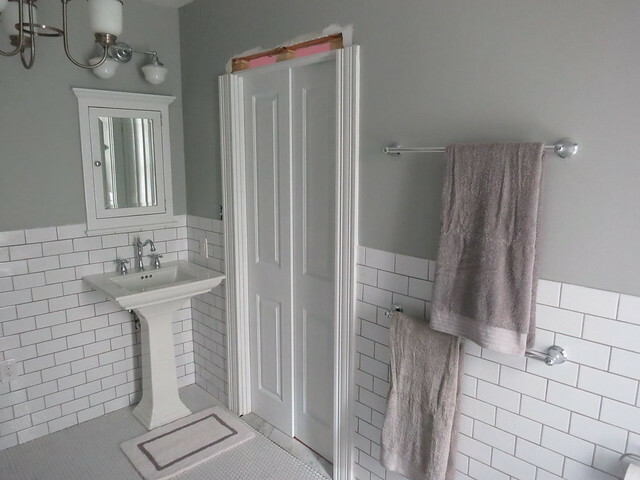 I have towel rings for either side of the sink and special hand towels to share but they aren’t quite ready. 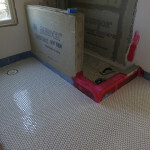 Now we wait for the shower enclosure. Another week and a half until it comes in and then hopefully just another couple days until it’s installed. We hired out the shower enclosure. Those pieces of glass are HEAVY and it’s hard to find a supplier who will sell direct.